To help patients with muscle disorders, scientists at The University of Texas Health Science Center at Houston (UTHealth) have engineered a new stem cell line to study the conversion of stem cells into muscle. Findings appeared in Cell Reports. “We have also developed a more efficient strategy to make muscles from human stem cells. Scientists can use these cells for disease modeling, gene correction, and potential cell therapy,” said Radbod Darabi, MD, PhD, the study’s senior author and an assistant professor in the Center for Stem Cells & Regenerative Medicine at McGovern Medical School at UTHealth. Muscle disorders such as muscular dystrophy cause muscles to weaken and deteriorate, and they affect more than 50,000 people in the United States. Symptoms include difficulty walking and standing. In severe cases, the disorders might involve cardiac and respiratory muscles and lead to death. There is no cure. 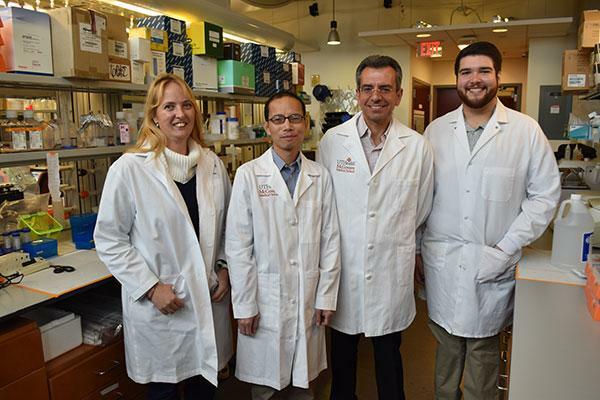 Darabi’s team engineered a novel human stem cell line for skeletal muscle. To ensure the purity of the muscle stem cells, they tagged muscle genes (PAX7, MYF5) with two fluorescent proteins. “In order to improve the formation of the muscle from stem cells, we screened several bioactive compounds. We were also able to observe muscle stem cell activity in great detail using color tags,” he said. In the lab housed in the Brown Foundation Institute of Molecular Medicine for the Prevention of Human Diseases at UTHealth, the team used a gene-editing method called CRISPR/Cas9 to add the fluorescent tags to the genes. The stem cells were generated from a patient’s skin cells and used to generate muscle. “Our current research provides a step-by-step roadmap to make muscle stem cells from these cells,” Darabi said. The team’s “approach also allowed induction and purification of skeletal myogenic progenitors in a much shorter time course (2 weeks) with considerable in vitro and in vivo myogenic potential (myofiber engraftment and satellite cell seeding),” the authors wrote. The modified stem cells produced promising results in a culture of human tissue, as well as in a mouse model of Duchenne muscular dystrophy. “In a side-by-side comparison with previous strategies, our strategy allowed faster and more efficient generation of muscle stem cells with superior engraftment in mice,” Darabi said. Darabi believes these muscle stem cells will initially be used by researchers to study the pathophysiology of muscular dystrophies, create disease models that scientists can use to test promising drugs, or evaluate gene correction efficiency. Human bodies are constantly replacing skeletal muscle cells but muscle disorders make it difficult to replenish muscle due to the failure and exhaustion of muscle stem cells. It is Darabi’s hope that the cells can one day be used as a form of stem cell therapy. Darabi’s UTHealth coauthors are Jianbo Wu, PhD (lead author); Nadine Matthias, DVM; Jonathan Lo; Jose L. Ortiz-Vitali; and Sidney Wang, PhD. Also contributing to the paper’s research is Annie Shieh, PhD, of State University of New York Medical School in Syracuse. The study, titled “A myogenic double-reporter human pluripotent stem cell line allows prospective isolation of skeletal muscle progenitors,” was supported by the National Institute of Arthritis and Musculoskeletal and Skin Diseases (National Institutes of Health awards 1R01AR068293 and 1R21AR071583). Darabi and Wang are on the faculty of The University of Texas MD Anderson Cancer Center UTHealth Graduate School of Biomedical Sciences. Ortiz-Vitali is a graduate student from the school. Wang is an assistant professor at the Center for Human Genetics in the Institute of Molecular Medicine at UTHealth.